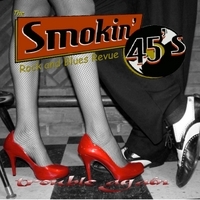 Formed out of veterans of the Detroit music scene, the Smokin' 45s are bringing fans their special blend of Rock and Blues. Their live show takes the music up a notch, making for a night of lively entertainment including songs from a wide variety artists like Joe Cocker, Little Charlie and the Nightcats, ZZ Top, Little Walter... as well as their own music which stands tall next to that of their well-established influences. There's no room in these sets for long, drawn-out, self-indulgent solos. These sets are packed with heart-pumping, foot-stomping rock and blues with a distinctive Detroit drive.